A simple numbers passing soccer drill can teach your players to communicate clearly and effectively. Ensure players call for the pass, and that they call to the player they are passing to. - Give each player a number. 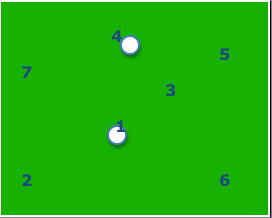 - Players pass in numerical sequence: #1 to #2 to #3 etc as they move around the area. - Use 2-3 balls to increase speed and awareness. - Ensure players move all around the area, not just close to the players they pass to. - The players should all be calling for the ball when their turn, and all be calling to the player they are passing to. - 1st touch into space with acceleration. - Turn in another direction. - Or try odd numbers 1 touch, even numbers 2 touch. - 5-7 minutes for this numbers passing warm-up drill.